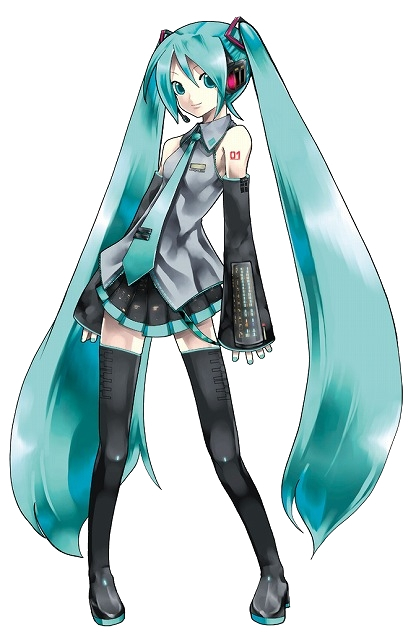 Hatsune Miku is a “digital diva” her songs are created using special software and the sampled voice of the voice actress Saki Fujita. The songs are then brought to life using amazing 3D projections on a live stage in front of huge crowds of fans. The type of music she sing falls under the Vocaloid (ボーカロイド Bōkaroido) genre, I am not a major follower of this music however since attending cosplay events over the past few years I have started to hear it more and more. Also this music seems to becoming ever more popular throughout the world not only in Japan. Below is my favorite song of the live performances to give you more of an idea of what it looks and sounds like when put together. Another Vocaloid song I love is Happy Synthesizer. I really hope that one day Hatsune Miku will come to the UK as I would love to see it for myself. If you love Japanese things I would reccomend that you check out some of the Vocaloid dance video’s on Youtube as there are some brillian dancers out there and this trend seems to be spreading accross the world like wild fire. Posted by theloveofjapan on July 11, 2011 in Entertainment, Fun, Videos and tagged cosplay, dance, Happy Synthesizer, Hatsune Miku, Vocaloid. yeah i felt a bit weird writing “her” but the second you give a face to a program or machine its seems the right thing to do. I guess as technology progresses we will be calling things him and her more and more. Asimo the robot for example. We were just at her big American Debut concert in LA, and the kids went nuts for it! There were over 6000 people at the concert alone! The actual music is not really for me, but I find it really intriguing as a cultural phenomenon at least. It’s really surreal, especially watching the crowd react and “interact”!